When corals are under stress, often caused by rising sea surface temperatures, the symbiotic relationship between the corals and their zooxanthellae (unicellular algae) breaks down. The zooxanthellae, which give pigments to the corals, slowly leave causing the coral to become paler and paler. In severe bleaching events, all of the zooxanthellae leave and the coral becomes white, thus the term bleaching. On coral reefs, zooxanthellae contribute food in the form of sugars to their coral. When corals bleach, they are not getting enough energy. Coral may live for several weeks in this condition, but if the stressor doesn’t go away (ie – if the sea surface temperature doesn’t decrease), then the coral will slowly starve to death. If however, the stressor does go away, the zooxanthellae may repopulate the corals and the corals may survive. It is thought, however, that corals are more prone to disease shortly after recovering from a bleaching event. Bleaching is often a result of elevated sea surface temperatures but may also be caused by chemical pollutants, high light levels, exposure to air, or other stressors. An extremely severe coral bleaching event occurred in the coral triangle in the Pacific Ocean in 1998 due to high sea surface temperatures. Similarly, the Caribbean suffered an extreme bleaching event in 2005, where some reefs lost as many as 30% of their shallow corals. The movie on the right explains coral bleaching in more detail. reef, in particular the shallow water population of staghorn and elkhorn corals around Bonaire and the adjacent island Klein Bonaire. 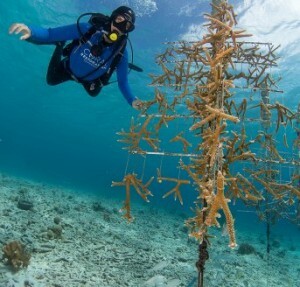 The main production coral nursery is situated on Klein Bonaire, where the coral is disturbed as little as possible and more nurseries are located in front of Buddy Dive Resort and Harbor Village and are used for training and demonstrations. The total nursery coral capacity is almost 7000 corals. After approximately eight months spent in the nursery, healthy and mature corals are transplanted to degraded portion of the reef, the restoration sites. 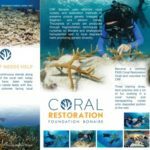 CRF works together with local businesses and dive operators, like Buddy Dive Resort and Great Adventure Bonaire to keep restoring the reef, promote awareness and involve and train tourists and local people as Coral Restoration divers who can join the CRF volunteer team. 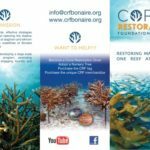 If you are interested and get involved in the CRF Bonaire project come and join our presentation every Monday at 6.30pm at the Buddy Dive Resort poolbar. SUPPORT CRF BONAIRE AND BUY A 10$ CRF TAG!